Looking for a super lightweight but effective tubeless sealant? 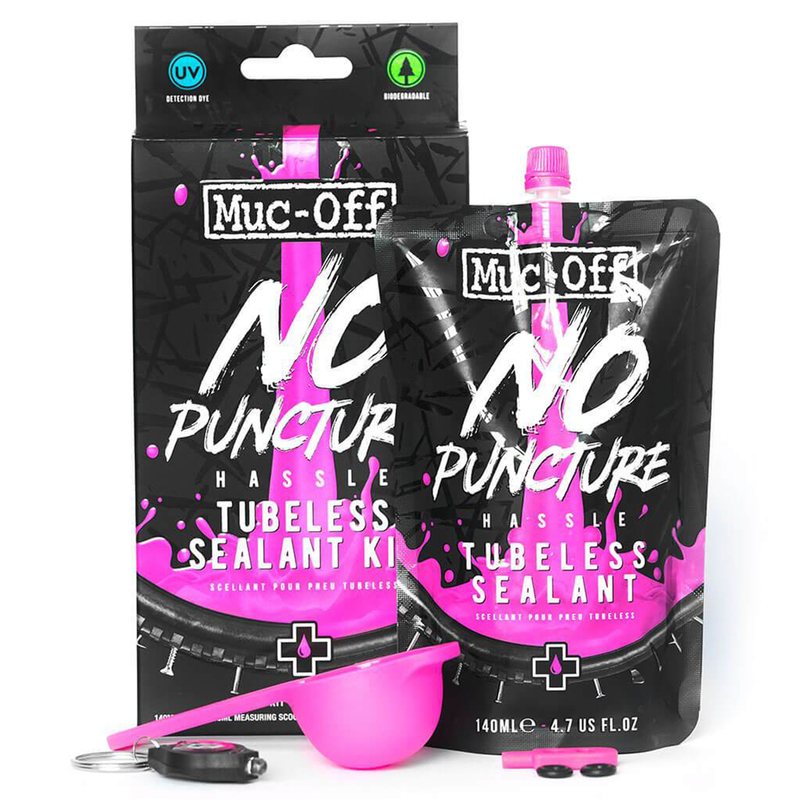 Muc-Off No Puncture Hassle performs under the most brutal of conditions. Using cutting-edge microfibre molecules help to fill the bigger holes and tears, whilst the advanced latex forms a strong seal instantly. This formula also contains a unique UV detection system that highlights any punctures you haven't seen during your ride. Developed with the world's top downhillers and pro peloton teams, to give you the finest tyre sealant available. It's non-corrosive, biodegradable and easily washes off with water. Compatible with tubeless ready and full UST wheels/tyres, No Puncture Hassle works from 15psi-120psi and temperatures from -20°C to +50°C. The pouch is designed to fit your Presta valve perfectly and is ideal to add to your toolkit or ride pack for emergency top ups on the go! I have used this sealant a number of times now and it has always worked well. Also great to get the included valve tool and U.V light. Easy to use. Best done with a removable valve core. Have 27.5 tyres, so used whole pouch on two tyres. Will see if this is enough, if not will add more. Sealed straight away, ride two had my first thorn which sealed instantly. Handy pack to have in your bag. Basic kit including what you need to get started. Be aware of size of your tire and how much fluid you get in this kit. Quick shipping to Sweden.